I was in my study chillin', like most nights, when wifey came running in with another "Come look at this!" I followed her to the room and I was given the silent "shhh..." signal, with her index finger to her lips, as I entered. 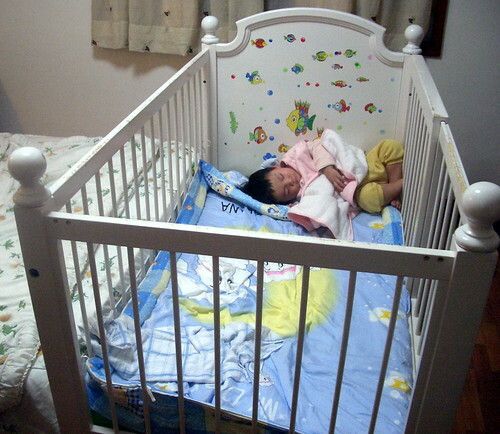 There Gabriel was, tucked snugly in the corner of his relatively big crib, snoozing away. I was composing what I saw into a picture in head as I headed back to the study to fetch the camera. I took that shot and had the perfect caption in mind. Spinnee: Not to mention snug and comfortable. Sunflower: I hope his gf will be just as *cough* flexible *cough cough*. 'HiaoAunty: No point lah. You move him to the middle, 10 minutes later, he will be back in the corner again. eh! remind me of my cats! RN: Welcome to the blog! Yeah, he does reminds be a bit of Hobbes when the latter is having its siesta. Just hope that Gabe don't go up to be a ngeow person. Just a cat loving (or any other animals for that matter) person will be fine.